Velma Cartwright loves visiting the Senior Resource Center and knows the schedule well. Thursdays are marked for “exercise,” and Fridays bring yoga lessons. 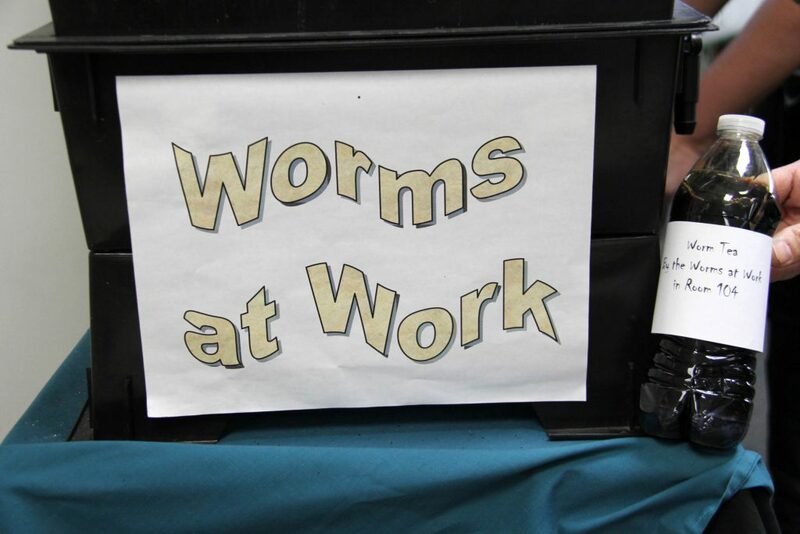 The center’s consistent calendar was thrown for a loop when “Worm Day” was scheduled for a recent Wednesday. The atypical entry was for a lesson led by Creeds Elementary School first-graders. Cartwright and almost a dozen senior citizens weren’t going to miss it. 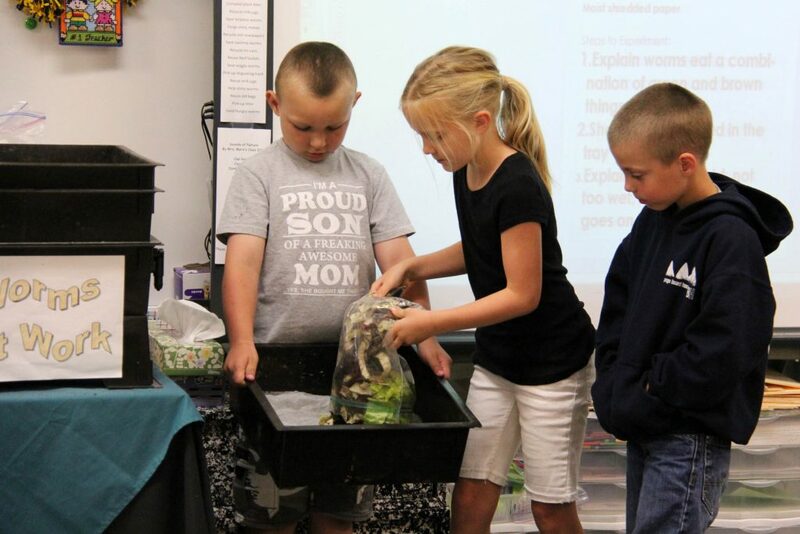 The proud former Creeds student was met by equally proud Creeds first-graders who were eager to show off their class pets – thousands and thousands of earthworms. 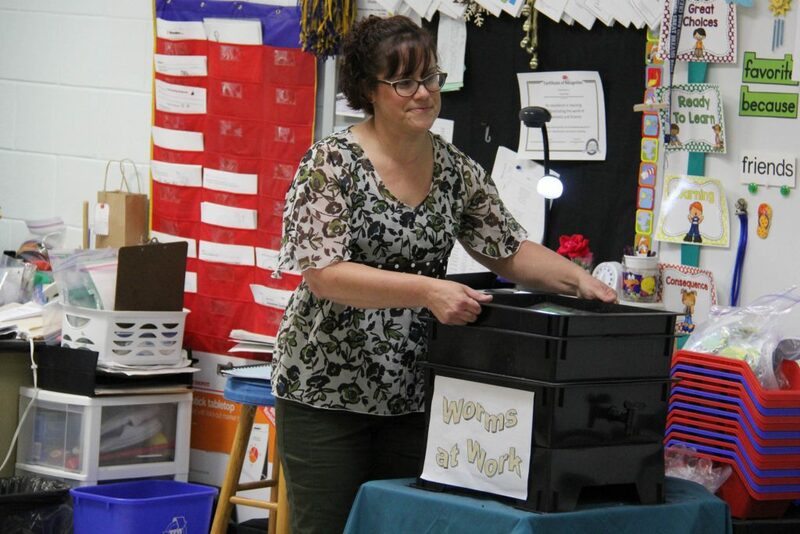 “We’re going to start by telling you about the vermicomposter, which is where we started,” began first-grade teacher Diane Marx. “Back in August, I went out to my composter at home and picked out about 100 worms. We started with 100 in September, and Mrs. Conger is estimating that we have 12,000 worms with the ones here and outside. We had to build the one outside because they were overpopulating in here,” explained Marx. 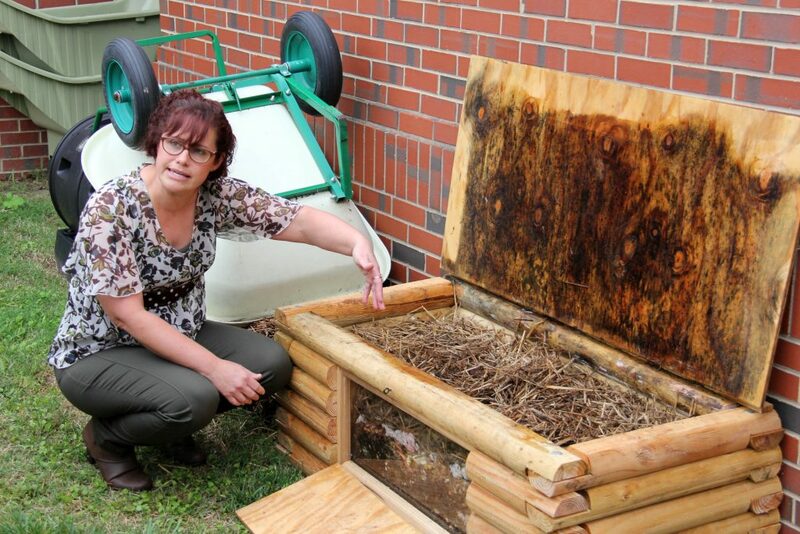 The seniors would get to see the “worm mansion” outdoors, as Conger called it, but the worms at work in the first-grade classroom were the focus of the lesson for now. “Watch when I pick it up,” said Marx. “WORMS!” students screamed with delight at the sight of worms dangling from the holes in the composter. “When I picked it up an hour ago there were even more worm bottoms sticking out,” said Marx. “Worm butts,” snickered a few students. Marx invited the seniors to come forward for a closer look. “Oh, I thought you put dirt in there,” said one guest. “There’s no dirt. It’s worm poop,” clarified Conger. 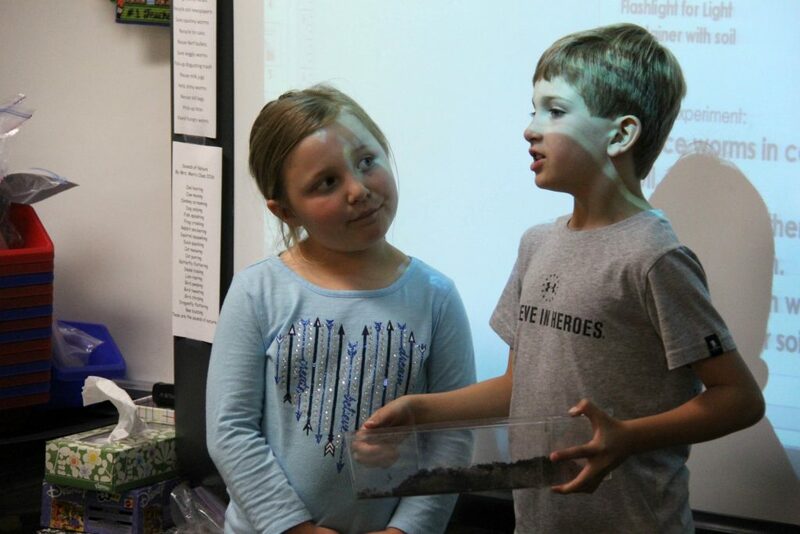 Playing with worms was next for first-graders who posed questions and offered explanations using their class pets. The first question: Do worms like light? Marx used a document camera to make the experiment visible on the classroom whiteboard. “You can see their front end is already trying to figure out how to get out of the light,” noted Marx. The seniors laugh as they watch the worms wiggle and search for darkness. “So what conclusion did we come to?” Conger asked the first-graders. “They do NOT like light,” announced a student. The remaining eight questions ranged from how fast worms move and their preferred habitats to what they eat. “Here, little wormy,” called a student attempting to direct a worm to one habitat. “Must be a senior citizen,” quipped one senior making all the adults in the room laugh. 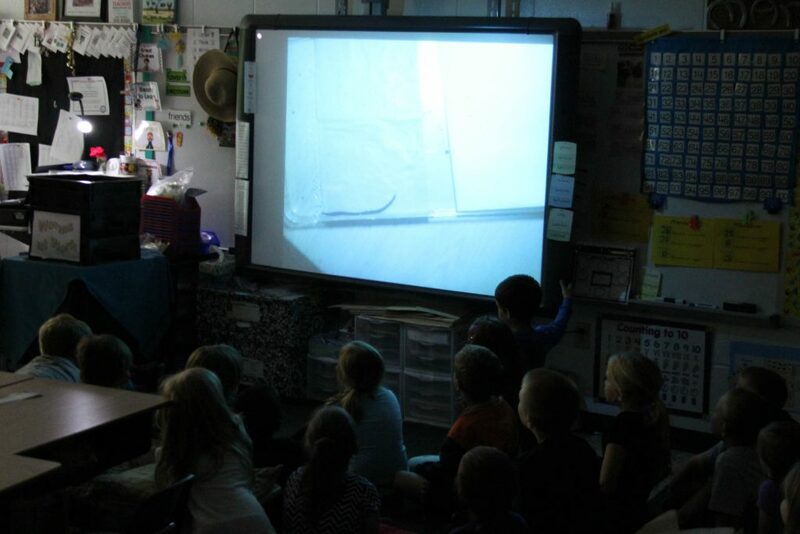 Students used a bag of food scraps to show what worms eat and how they prep a new level of the vermicomposter. “Worms eat apples, banana peels, lettuce, soft carrots and coffee grounds,” reported one student presenter. Marx asked student presenters what should be kept out of the composter? “Cheese and meat,” answered a student. Marx topped off the “dish” with layers of moist shredded paper. “That looks yummy for worms!” a first-grader exclaimed. “‘Yummy, yummy,’ say the worms,” said another student. “We think it’s worm pee,” said a student. “It’s a super fertilizer,” said another. “If you use it on plants, it makes them grow bigger than it’s supposed to be,” said a third student. Using it on plants is exactly what Creeds fourth-graders are doing as part of their studies on measurement, a citywide grade-level objective. Conger explained to their guests that fourth-graders designed and measured quadrants for four plant beds located not too far from the outdoor worm mansion. Each quadrant has the same plants but the fertilizer is different so the students can study how that factor impacts plant growth. Worm tea and worm castings from the first-graders’ worm farm fertilize two of the beds. Store-bought fertilizer, Miracle Gro, is used with the third set of plants. The fourth bed has compost made on-site from students’ lunch scraps. “The green beans are loving the worm team,” shared Conger. The collaborative project has fourth-graders writing letters to first-graders with questions about the worms. First-graders respond with their own letters including questions about plant growth. 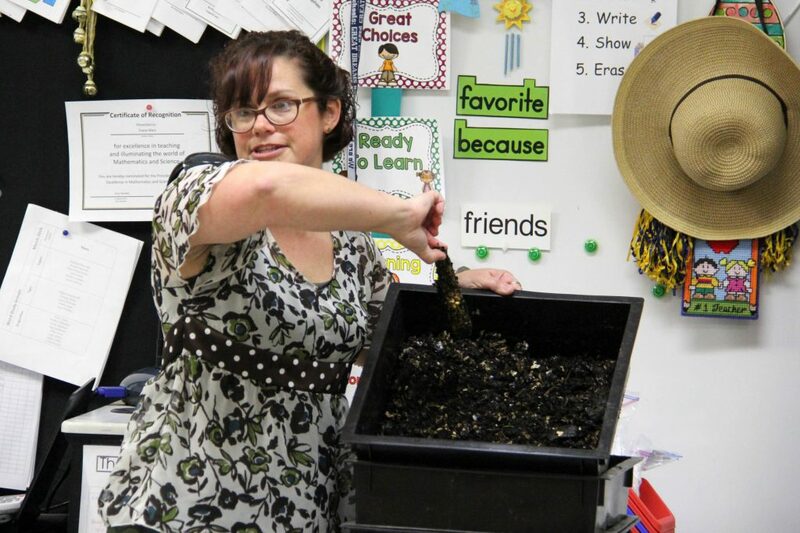 “They have taught the fourth-graders about worm farming and the fourth-graders count on them to provide the fertilizer they need for their gardens. It’s a true family event,” Conger said. “Did you know worms could be so exciting?” Conger asked their special guests. “You can save the coffee grounds at the senior center. That would be a nice partnership,” she added. As Conger escorted the senior visitors to the front of the school, Juanita Swoope marveled at what she had seen over the last hour. “We didn’t do anything like that when I was in school. It was very interesting to see what the kids are doing today,” she said. Cartwright was in awe, too. 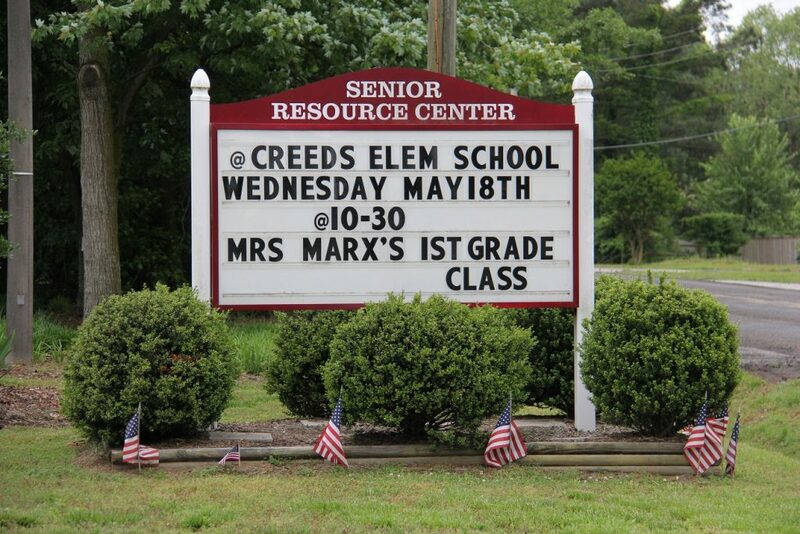 There’s that Creeds pride again. 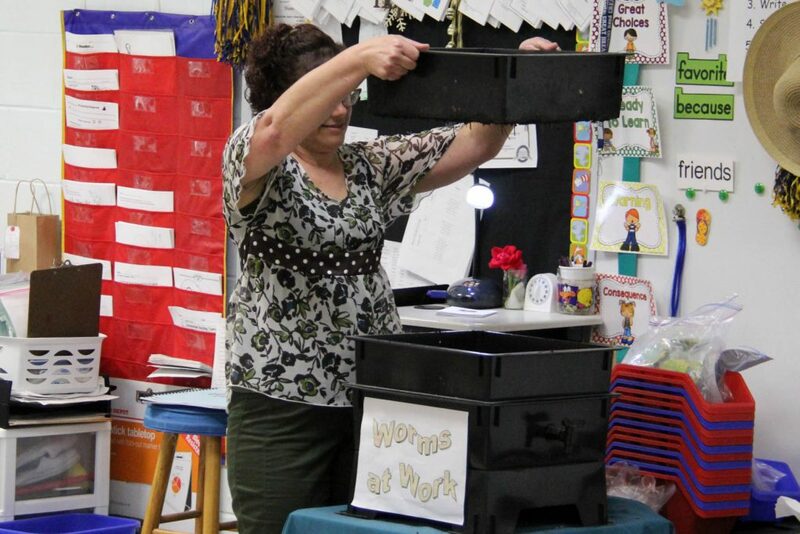 The first-graders may have found themselves a new worm farmer. That is, after dominoes on Mondays and cards on Tuesdays. 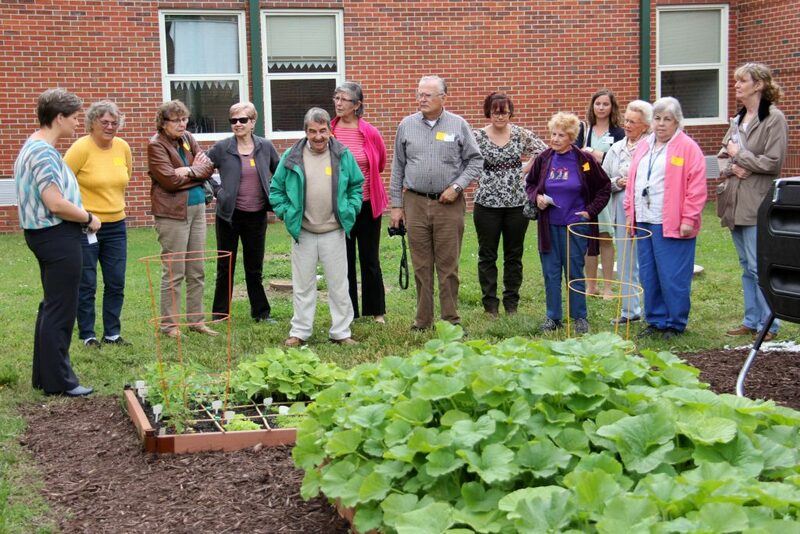 This Creeds Elementary School garden project is supported by a Virginia Beach Education Foundation grant underwritten by Waller, Todd & Sadler Architects. To learn more about the foundation, visit www.vbef.org.